Not too many years ago we published a criticism of people that claim to speak to the dead. The article quoted a man who declared that such assertions were hoaxes. 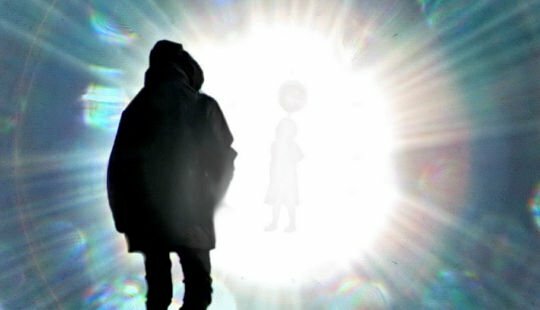 The man claimed that people who receive information from, or see images of people long dead, are receiving recordings of that person’s experiences while still alive. He called this electronic voice phenomenon (EVP) and said this phenomenon was no more than mediums talking to themselves. He explained that he believed the visions of spirits to be holographic projections from our own minds and nothing more. I published his story, but with great personal reservation. That is because before he made these claims, I had visited my own mother after her passing in 1998. Also my wife, Doris J. Donahue, who has the amazing ability to communicate with spirits beyond the veil, received at least two messages from her before she went on into the light. Those personal experiences involved images and information received that I was convinced could not have been old recordings of things said or done, or imaginary mental visions created from my mind. But you may draw your own conclusion in this. To tell the story in brief, I had been successful in leaving my body with the help of the Robert Monroe tapes, issued by the Monroe Institute at Faber, Virginia. After her death, I wanted badly to see my mother and say good-by. She died quite suddenly and the family had her remains cremated before the funeral service and before my wife and I could get to Albuquerque, where she and Dad were living. With her remains already disposed, I felt as if I had been robbed of closure. Before that visit with her in the spirit world, my experimental trips out of the body amounted to no more than flying up through the roof of the apartment building we lived in, and going to visit friends and family members, then testing them with what I had observed at that specific time. My experiments proved to me that it was not a trick of the mind; I had actually been there. One evening when I was alone in the apartment, I played one of the Monroe tapes styled to assist us in leaving the body, went into the proper mental state, and without warning I zoomed out into darkness. Suddenly Mom was before me. Only instead of the dying, wheelchair-ridden 80-plus-year-old woman I remembered when last seeing her, she was in a young body . . . at about 32-years and in the prime of life. She was smiling, glad to see me, and we spent precious moments together there in the astral. But it appeared to be a silent visit. There was no sound and if we communicated, it was telepathic. I returned with no memory of anything we might have spoken of. A day or two after that, Doris agreed to try to open dialogue with Mom and see what kind of message she had for us. She reached her right away. We were told that Mom was happy, and glad to be breathing normally and feeling well again. It was as if she did not yet realize that she had died. She did say, however, that she was worried about Dad because he was no longer taking his pills. She gave specific instructions to contact him and tell him to start taking his medicine. She also said she thought she would stay where she was and wait for Dad to catch up with her. A few days after this I talked to my father on the telephone, gave him Mom’s message about the pills. He admitted that he had not been taking them. He also told me about a woman he was seeing, and asked what I thought about it. I joked that at his age, he needed to take advantage of every day and that I had no problem with him finding companionship. I am not sure if Mom agreed, however. I made a second visit to the astral to see her, and this time things were dramatically changed. Instead of in her human body, I found Mom surrounded by light. It was so bright I had difficulty seeing her. I remember that we hugged before I suddenly slammed back into my body. Doris and I conducted a second communication with Mom after that. She told us that she had decided not to wait, and that she was going on into the light. She spoke of how amazing things were on the other side, and that she thought Dad would love being able to fly at will among the stars, visiting the planets. That was our last contact with Mom. I have no doubt that she was somewhere beyond the veil and that I succeeded in making contact. And I truly believe that the messages received by Doris at that time were directly from her. They were not creations from our minds. In spite of the skeptics, I believe I had the great privilege of giving my mother a proper farewell, but I had to do it in spirit form. It has given me comfort in dealing with her passing. Since that day, we have learned much more about death and just what we all can expect when it is our turn to leave these bodies. Doris passed on a few years later from prostrate cancer and I have reason to believe she may still be near.